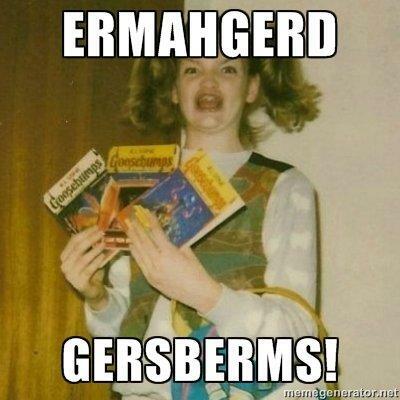 Maggie Goldenberger seen in her famed Internet meme. Kids are an endless source of entertainment (or irritation, depending on your perspective), and they have been cropping up all over the news this week. From an overly-enthusiastic nephew to an awkward childhood photo, the headlines have been dominated by tykes. Let’s take a look back, shall we? A Swedish children’s program has released a music video of a song about menstruation, featuring dancing, googly-eyed tampons and a rap by male host Alex Hermansson. For your pleasure, here is a sample of the lyrics: “Period, period, hip hip hooray for period!/The body’s working as it should/And that is really, really good – hooray!” Educating kids about women’s reproductive functions is without doubt a positive thing; we just hope the next generation of Swedish teenagers doesn’t expect their tampons to get down and boogie on a Friday night. If you’re ever haunted by cringe-worthy memories of your adolescence, just feel thankful that an awkward photo of your younger years was never disseminated across the Internet and ossified as a hilarious meme. Maggie Goldenberger, also known as the “Ermahgerd Girl,” spoke to Vanity Fair about the story behind the now-infamous photo of herself as a child clutching several Goosebumps books and sporting pigtails, a retainer, and a rather unflattering expression. Goldenberger said that the photo was taken while she was goofing around with friends, playing a character named “Pervy Dale.” She also revealed that she is not actually a fan of the Goosebumps novels. Her thoughts on mashed potatoes have yet to be disclosed. Two Argentinian artists have caused quite the uproar by transforming beloved childhood toys into religious icons. “Barbie, the Plastic Religion,” which opens in Buenos Aires on Saturday, will feature 33 Barbie and Ken dolls dressed as Hindu deities and revered Catholic figures, including Jesus and the Virgin Mary. Word of the show has sparked outrage in the overwhelmingly Catholic Argentina. One of the artists, Pool Paolini, said he did not “understand why the Barbie was a problem” and added that the project sought to “blend the two biggest icons in the world, Barbie and religion.” Somewhere out there, Cher is weeping. A Manhattan woman lost a lawsuit against her 12-year-old nephew, who allegedly broke her wrist with an overzealous hug. Jennifer Connell had sued Sean Tarala for $127, 000, claiming that the incident — which went down at the boy’s eighth birthday party — made it difficult to climb the stairs to her apartment in New York’s Upper East side. Connell also asserted that she was unable to comfortably hold her hors d’oeuvres plate at a recent party. That faint sound you’re hearing in the distance is the world’s smallest violin.